Amid reports that opioid overdose deaths in New York City have climbed over the past year to fresh record highs, the Senate has passed a sweeping suite of legislation designed to stem the flow of deadly and illicit synthetic opioids like fentanyl into the US via the US Postal Service, while also offering new tools to law enforcement and funding for addiction treatment. The bill, known as the "Synthetics Trafficking and Overdose Prevention - or STOP - Act", was passed by a 99-1 vote one month after President Trump declared that the constant flow of fentanyl into the US via illicit labs in China and Mexico was "a form of warfare." The law requires that the US Postal Service to keep electronic records of incoming foreign shipments like their contents and the identity of the sender - records that other shippers like UPS and FedEx already provide. It also includes funding for treatment while altering laws to increase the availability of certain medications designed to fight addiction. The bill was introduced by Ohio Senator Rob Portman and will help customs agents close a prominent and widely exploited loophole for drug traffickers. 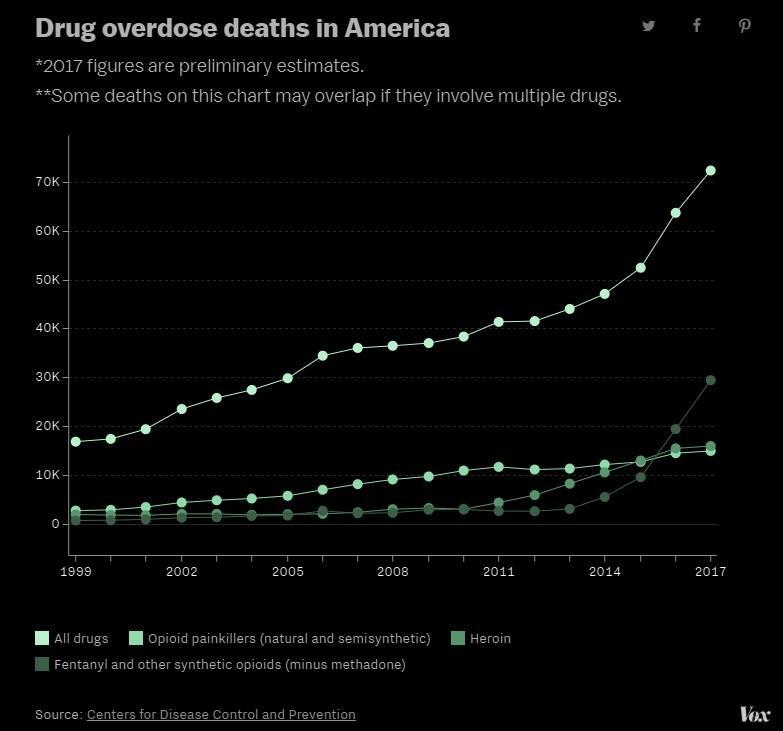 Opioid deaths have soared to record highs across the US last year, with 72,000 reported by the CDC in 2017, a 10% increase from the year before. The bill will now travel back to the House, which will need to approve changes made in the Senate version. The passage comes at a poignant time for activists as deaths in NYC have reached a fresh record, even as the rate of increase has slowed. Many of these deaths are being attributed to fentanyl, a synthetic opioid that's 50 to 100x stronger than morphine. It was involved in 57% of overdose deaths in NYC last year, up from 44% in 2016. Because fentanyl is so much cheaper than heroin, dealers use it to cut their batches of illicit drugs to save on costs. At a cost of more than $8 billion, the package of bills includes a variety of new guidelines and mandates for federal agencies, as well as additional restrictions to prevent the synthetic opioid fentanyl and other drugs from being shipped into the country -- a particular point of emphasis for the Trump administration. Also included in the legislation is a provision allowing the Food and Drug Administration (FDA) to require drug makers to package smaller quantities of drugs such as opioids, as well as expansive new grant programs designed to fund drug treatment and recovery centers and research funding for longer-term solutions. And the measures would more than double the number of patients to whom doctors can prescribe buprenorphine, a drug used to treat opioid addiction, to 275. The Senate bill is slightly different from the House bill: For example, the Senate bill orders the Department of Health and Human Services to review best practices for sharing confidential patient information among qualified medical personnel. The House meanwhile has balked at this, citing privacy concerns. The passage comes after the Trump administration declared the opioid epidemic a public health emergency a year ago, freeing up some federal funds to combat the crisis. Of course, Sen. Mike Lee, the lone hold out, has blasted the bill as a giant waste of taxpayer money that will do little to stem the flow of illegal drugs into the US. However, given the bipartisan support and growing political pressure ahead of the midterms, it's likely that the revised bill will sail through the House.